points. The accumulated points can soon be redeemed for prizes from an online shop or via mobile phone. loyalty experience. The scheme is already in its fourth phase as it as already given away several prizes including; Coca-Cola gadgets, mobile phones, McDonalds' vouchers, Supermarket discount vouchers & Abba â€˜Mamma Mia' tickets. 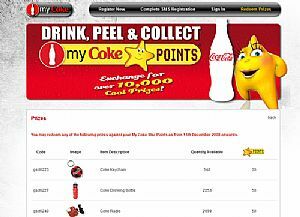 In the coming weeks we will be seeing the launch of three website for Coca-Cola, Coke Zero and Diet Coke.